See something in a show that you would love to own? Now you can! If something interests you, please email estrellita.edwell@woollymammoth.net or call 202-312-5262 to set up a time to come and purchase it. Office hours are 10am to 6pm, Monday through Friday. Cash or check made out to Woolly Mammoth Theatre Company will be accepted. Unfortunately, we cannot deliver or mail items. Dollhouse from The Nether. 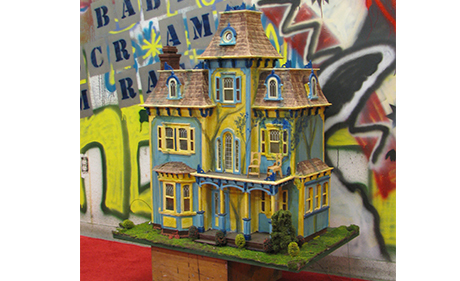 Built from a kit and painted by Set Designer Sibyl Wickersheiner. Asking $400. Formal dining buffet from the set of Familiar. Asking $225; was originally $450. 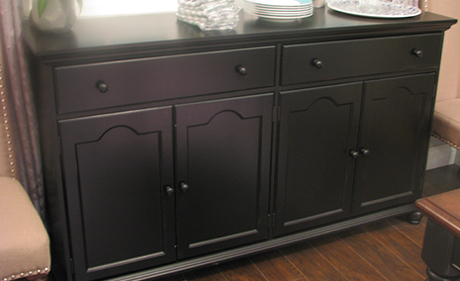 Ebony wood, 60” wide x 35” high x 16” deep with two drawers and two cabinets. 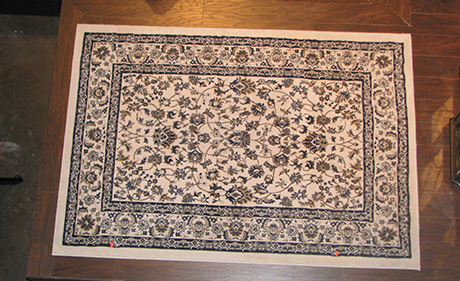 Large rug from Familiar. Asking $200. 13 feet long x 9' 8" wide. 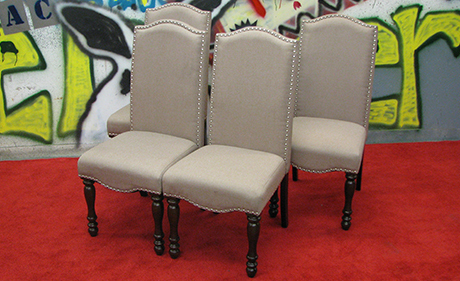 Set of four dining room chairs from The Arsonists. Reupholstered in a taupe linen with nail head trimming. 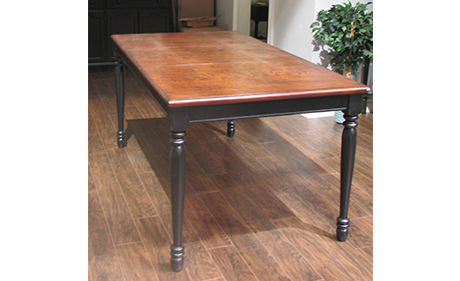 Walnut finish on the legs. Originally cost $350.00, selling the set for $200. 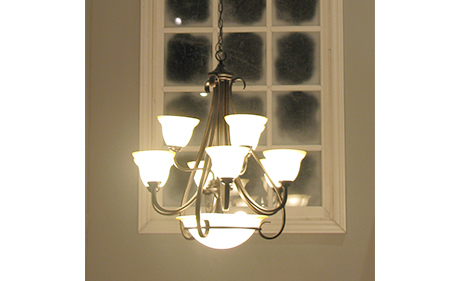 Chandelier light fixture from Familiar. Asking $150, was originally $387. 32” in diameter with 9 lights. 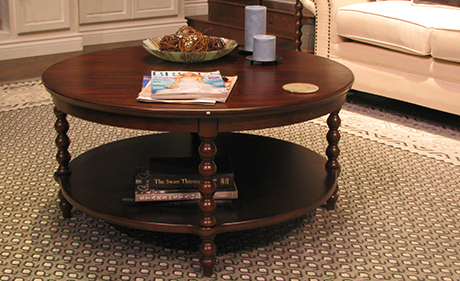 Round coffee table from Familiar. Asking $150, was originally $270. 19” tall x 38” in diameter. Recliner from Familiar. Asking $150, was originally purchased for $400. 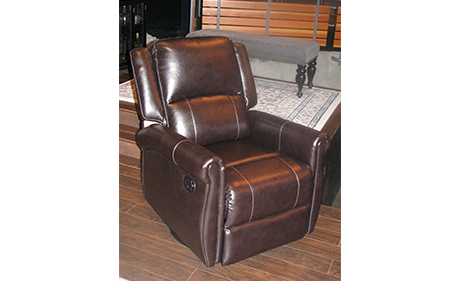 Brown leather; swivels, rocks, and reclines. Very comfortable! 37” high x 30” wide x 29” deep. 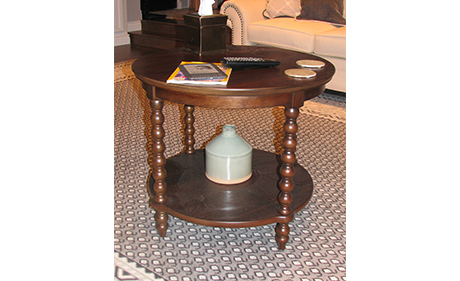 Round side table from Familiar. Asking $100, was originally $184. 28” in diameter x 24" high. Gray amchair from Familiar. Asking $75, was originally $215. 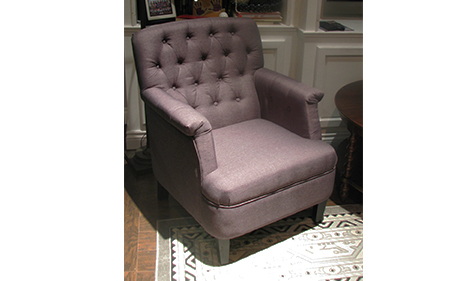 Gray upholstery, 36” high x 32" wide x 29" deep. 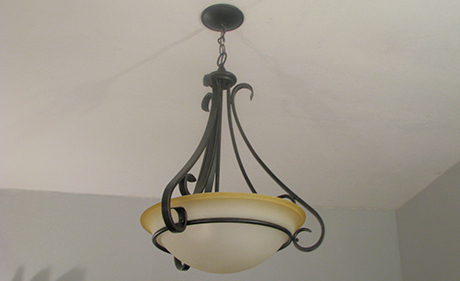 Pendant light fixture from the dining room of the Familiar set. 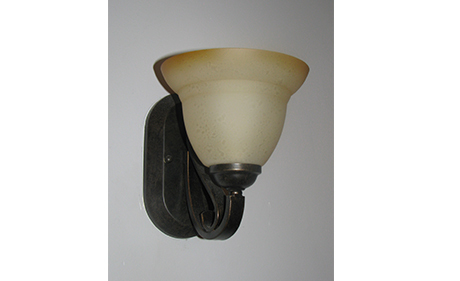 22” in diameter with 3 lights. Asking $75, originally purchased for $180. 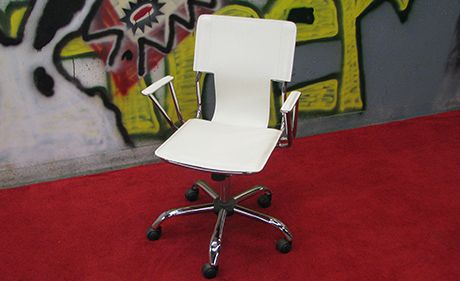 White leather office chair on casters from Women Laughing Alone with Salad. Four chairs available. Originally $169 each, asking $75 each or $250 for all four. 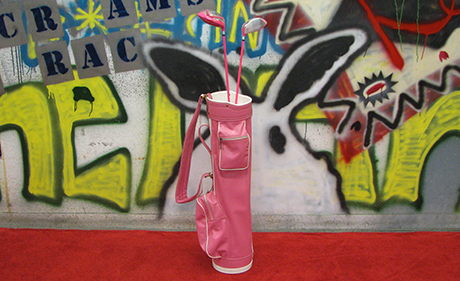 Pink golf bag from Marie Antoinette. Bag is $50. One golf club is available for $15. Full set of golf bag and golf club is $65. Note: Only one golf club is available for purchase, even though two are present in the image above. 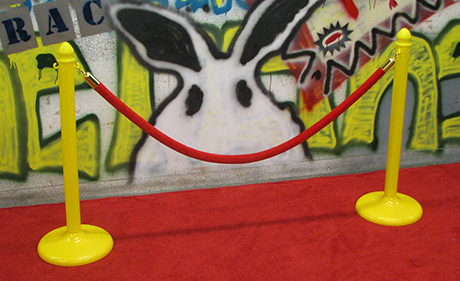 Pair of stanchions and rope from Collective Rage. Fun for your next Oscar party! Originally paid $100, selling for $65. 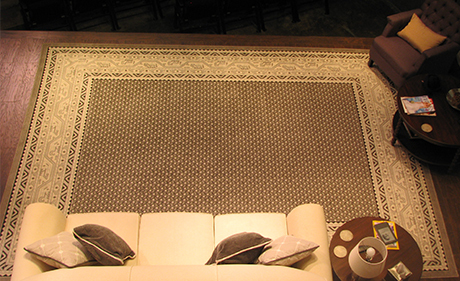 Medium-sized rug from Familiar. Asking $40. 6' 4" long x 4' 5" wide. 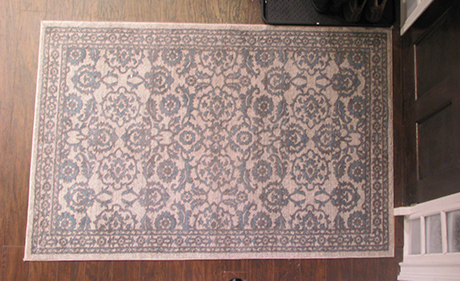 Small rug from the set of Familiar. Asking $40. 6 feet long x 4 feet wide. 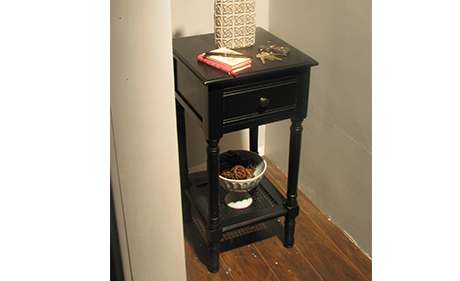 Tall side table from Familiar. Asking $40, was originally $90. 28" high x 14" wide x 23" deep. Care Bear bean bag chair and pink pillows from House of Gold. 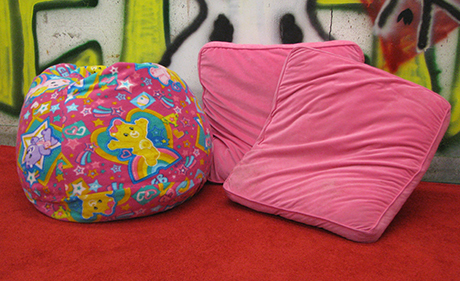 Bean bag is $25; pink pillows (which are 22" x 22” square) are $10 for the pair. All three can be purchased together for $35. 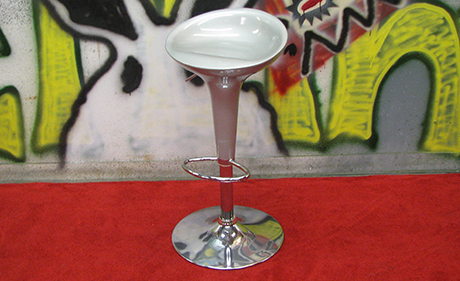 Silver swivel stool from Women Laughing Alone with Salad. Height is adjustable. Originally paid $75.00, asking $30. Blue swivel stool from Women Laughing Alone with Salad (and the HIR lobby). Originally paid $112. The stool has marks on it from use. It is 16” tall x 19” wide x 19” deep. 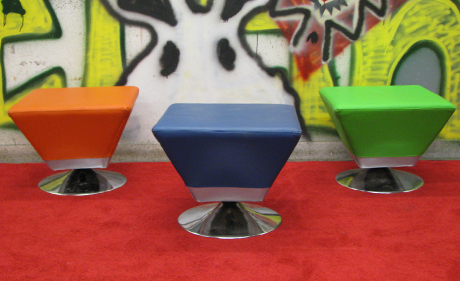 The orange and green stools are no longer available. 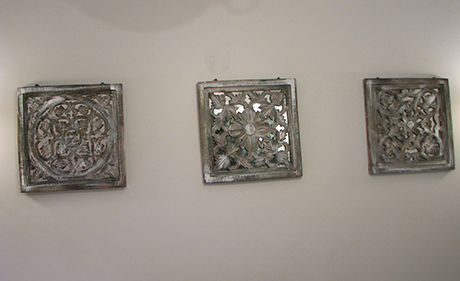 Set of 3 pieces of wall artwork from Familiar. Each is a 16" x 16" wooden carving with mirror behind. Originally $50, asking $20 for the set. 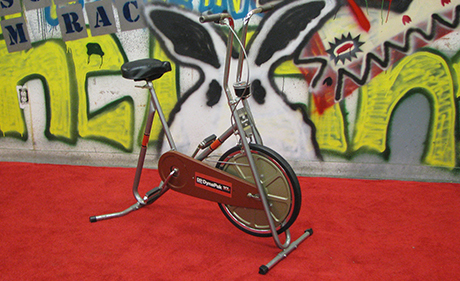 Vintage exercise bike from HIR. Asking $20. Seat is a bit wonky, could use some love. 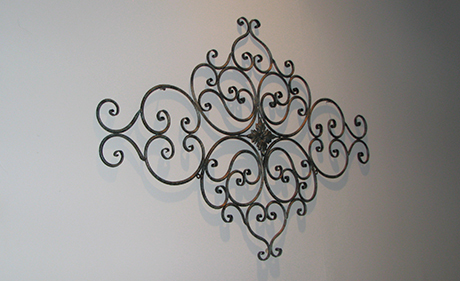 Diamond-shaped ironwork wall art from Familiar. Asking $15, was originally puchased for $40. 26” high x 38” wide. 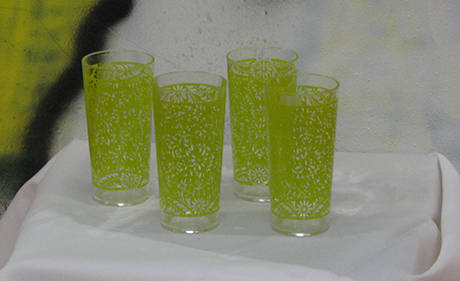 Set of 4 patterned acrylic glasses from HIR. Asking $10 for the set. 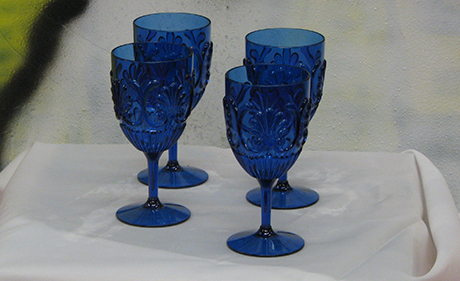 Set of 4 acrylic wine glasses from Marie Antoinette. Asking $10 for the set. 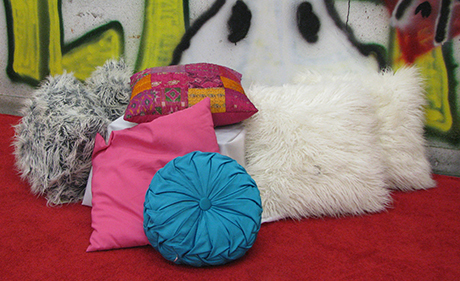 Miscellaneous pillows. Asking between $5 to $10 each. Please note that the "hairy" white pillows and the round blue pillow are no longer available. 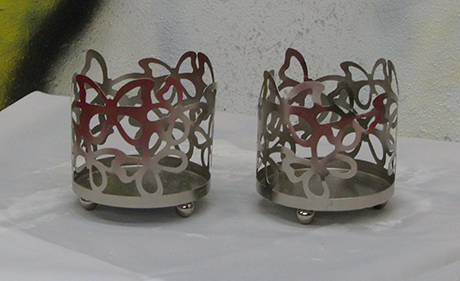 Baby Screams Miracle candle holders for 4" pillar candles. $5 for the set of 2. 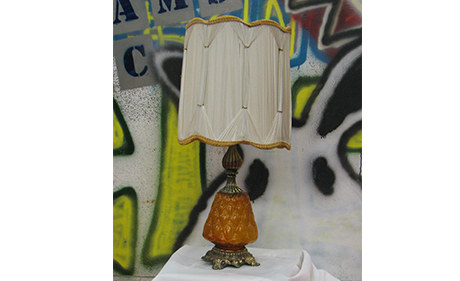 Really ugly lamp. Asking $5. Might need rewiring.